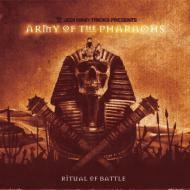 Ritual of Battle" is the sophomore album from independent super group, Army of the Pharaohs. The album includes performances from Jedi Mind Tricks' Vinnie Paz and Jus Allah, alongside Celph Titled, 7L & Esoteric, Chief Kamachi, Outerspace, Reef the Lost Cauze, and more. Out-of-print since its release, Babygrande Records is proud to present this digitally remastered album as a special edition Orange Vinyl set..